On Saturday 20th April 2019 the sun will rise at 06:02 and will set at 20:13. It will be a mild day, with temperatures reaching around 20.5°C. Today is expected to be a dry day, with a very low chance of rain. There will be a gentle breeze in the air today, with a maximum expected wind speed of 13mph. On Sunday 21st April 2019 the sun will rise at 06:00 and will set at 20:15. It will be a mild day, with temperatures reaching around 20.2°C. Today is expected to be a dry day, with a very low chance of rain. It will be a very clam day today, with a maximum expected wind speed of 9mph. On Monday 22nd April 2019 the sun will rise at 05:58 and will set at 20:17. It will be a mild day, with temperatures reaching around 19.7°C. Today is expected to be a dry day, with a very low chance of rain. It will be quite a breezy day, with a maximum expected wind speed of 19mph. On Tuesday 23rd April 2019 the sun will rise at 05:56 and will set at 20:18. It will be a mild day, with temperatures reaching around 18.9°C. Today is expected to be a dry day, with a very low chance of rain. It will be quite a breezy day, with a maximum expected wind speed of 20mph. On Wednesday 24th April 2019 the sun will rise at 05:54 and will set at 20:20. It will be a mild day, with temperatures reaching around 15.1°C. Today is expected to be a dry day, with a very low chance of rain. There could be quite a strong breeze in the air today, with a maximum expected wind speed of 22mph. On Thursday 25th April 2019 the sun will rise at 05:52 and will set at 20:22. It will be a mild day, with temperatures reaching around 12°C. Today is expected to be a dry day, with a very low chance of rain. It could be quite a gusty day today, with a maximum expected wind speed of 26mph. On Friday 26th April 2019 the sun will rise at 05:50 and will set at 20:23. It will be a mild day, with temperatures reaching around 5.5°C. Today is expected to be a dry day, with a very low chance of rain. It will be quite a breezy day, with a maximum expected wind speed of 19mph. 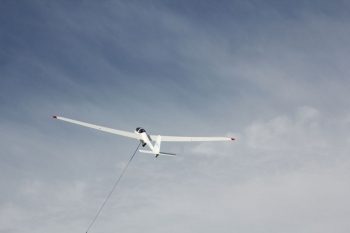 The sport of Gliding is one of the most exhilarating ways of getting in the air. The sensation of floating in the air in almost silence is an unforgettable experience. It is also one of the most cost effective ways of learning to fly. Our trial flying lesson is a brilliant introduction and is ideal for almost anyone. Age is no barrier, we have flown visitors from early teens to their 90s. It also makes a great gift – something a little out of the ordinary. Your trip will start with a briefing by one of our fully qualified flying instructors who will explain all of the safety aspects of your flight and also introduce you to the aircraft and make sure you comfortable. The glider will then be winch launched to a height of up to 2000 feet from where you really can get a bird's eye view of the Cotswolds; an area of outstanding natural beauty. During the flight you will be invited to take the controls or you can simply sit back and enjoy the ride while the instructor flies. If you like you can record the flight on your camera.